People are connecting to organizational resources in increasingly complicated scenarios. People connect from organization-owned, personal, and public devices on and off the corporate network using smart phones, tablets, PCs, and laptops, often on multiple platforms. In this always-connected, multi-device and multi-platform world, the security of user accounts is more important than ever. Passwords, no matter their complexity, used across devices, networks, and platforms are no longer sufficient to ensure the security of the user account, especially when users tend to reuse passwords across accounts. Sophisticated phishing and other social engineering attacks can result in usernames and passwords being posted and sold across the dark web. Azure Multi-Factor Authentication (MFA) helps safeguard access to data and applications. It provides an additional layer of security using a second form of authentication. Organizations can use conditional access to make the solution fit their specific needs. Before starting a deployment of Azure Multi-Factor Authentication, there are prerequisite items that should be considered. Hybrid identity scenarios Azure AD Connect is deployed and user identities are synchronized or federated with the on-premises Active Directory Domain Services with Azure Active Directory. On-premises legacy applications published for cloud access Azure AD Application Proxy is deployed. Using Azure MFA with RADIUS Authentication A Network Policy Server (NPS) is deployed. Users have Microsoft Office 2010 or earlier, or Apple Mail for iOS 11 or earlier Upgrade to Microsoft Office 2013 or later and Apple mail for iOS 12 or later. Conditional access is not supported by legacy authentication protocols. Your MFA rollout plan should include a pilot deployment followed by deployment waves that are within your support capacity. Begin your rollout by applying your conditional access policies to a small group of pilot users. After evaluating the effect on the pilot users, process used, and registration behaviors, you can either add more groups to the policy or add more users to the existing groups. It is critical to inform users, in planned communications, about upcoming changes, Azure MFA registration requirements, and any necessary user actions. We recommend communications are developed in concert with representatives from within your organization, such as a Communications, Change Management, or Human Resources departments. Microsoft provides communication templates and end-user documentation to help draft your communications. You can send users to https://myprofile.microsoft.com to register directly by selecting the Security Info links on that page. Conditional access policies enforce registration, requiring unregistered users to complete registration at first sign-in, an important security consideration. Some of the risk events detected by Azure Active Directory Identity Protection occur in real time and some require offline processing. Administrators can choose to block users who exhibit risky behaviors and remediate manually, require a password change, or require a multi-factor authentication as part of their conditional access policies. We recommended that organizations use conditional access to define their network using named locations. If your organization is using Identity Protection, consider using risk-based policies instead of named locations. Decide whether to mark the location as Trusted. Signing in from a trusted location lowers a user's sign-in risk. Only mark this location as trusted if you know the IP ranges entered are established and credible in your organization. Expand the drop-down menu and select the countries or regions you wish to define for this named location. Decide whether to Include unknown areas. Unknown areas are IP addresses that can't be mapped to a country/region. A push notification is sent to the Microsoft Authenticator app on your mobile device. The user views the notification and selects Approve to complete verification. Push notifications through a mobile app provide the least intrusive option for users. They are also the most reliable and secure option because they use a data connection rather than telephony. If your organization has staff working in or traveling to China, the Notification through mobile app method on Android devices does not work in that country. Alternate methods should be made available for those users. A mobile app like the Microsoft Authenticator app generates a new OATH verification code every 30 seconds. The user enters the verification code into the sign-in interface. The mobile app option can be used whether or not the phone has a data or cellular signal. An automated voice call is placed to the user. The user answers the call and presses # on the phone keypad to approve their authentication. Call to phone is a great backup method for notification or verification code from a mobile app. A text message that contains a verification code is sent to the user, the user is prompted to enter the verification code into the sign-in interface. Administrators must determine how users will register their methods. Organizations should enable the new combined registration experience for Azure MFA and self-service password reset (SSPR). SSPR allows users to reset their password in a secure way using the same methods they use for multi-factor authentication. We recommend this combined registration, currently in public preview, because it’s a great experience for users, with the ability to register once for both services. Enabling the same methods for SSPR and Azure MFA will allow your users to be registered to use both features. If your organization is using Azure Active Directory Identity Protection, configure the MFA registration policy to prompt your users to register the next time they sign in interactively. If your organization does not have licenses that enable Identity Protection, users are prompted to register the next time that MFA is required at sign-in. Users may not be registered for MFA if they don't use applications protected with MFA. It's important to get all users registered so that bad actors cannot guess the password of a user and register for MFA on their behalf, effectively taking control of the account. Create a group, add all users not currently registered. Using conditional access, enforce multi-factor authentication for this group for access to all resources. Periodically, reevaluate the group membership, and remove users who have registered from the group. You may identify registered and non-registered Azure MFA users with PowerShell commands that rely on the MSOnline PowerShell module. To plan your conditional access policy strategy, which will determine when MFA and other controls are required, refer to What is conditional access in Azure Active Directory?. It is important that you prevent being inadvertently locked out of your Azure AD tenant. You can mitigate the impact of this inadvertent lack of administrative access by creating two or more emergency access accounts in your tenant and excluding them from your conditional access policy. Browse to Azure Active Directory, Conditional Access. Provide a meaningful name for your policy. On the Exclude tab, check the box for Users and groups and choose your emergency access accounts. Under Cloud apps, select the All cloud apps radio button. OPTIONALLY: On the Exclude tab, choose cloud apps that your organization does not require MFA for. OPTIONALLY: If you have enabled Azure Identity Protection, you can choose to evaluate sign-in risk as part of the policy. OPTIONALLY: If you have configured trusted locations or named locations, you can specify to include or exclude those locations from the policy. Under Grant, make sure the Grant access radio button is selected. Check the box for Require multi-factor authentication. Set the Enable policy toggle to On. Legacy on-premises applications, which will need to use Application proxy. On-premises RADIUS applications, which will need to use MFA adapter with NPS server. On-premises AD FS applications, which will need to use MFA adapter with AD FS 2016. Applications that authenticate directly with Azure AD and have modern authentication (WS-Fed, SAML, OAuth, OpenID Connect) can make use of conditional access policies directly. Applications residing on-premises can be published to your Azure AD tenant via Azure AD Application Proxy and can take advantage of Azure Multi-Factor Authentication if they are configured to use Azure AD pre-authentication. These applications are subject to conditional access policies that enforce Azure Multi-Factor Authentication, just like any other Azure AD-integrated application. Likewise, if Azure Multi-Factor Authentication is enforced for all user sign-ins, on-premises applications published with Azure AD Application Proxy will be protected. With the CHAPv2 protocol, only authenticator app push notifications and voice call are supported. Conditional access policies cannot be applied. The NPS extension acts as an adapter between RADIUS and cloud-based Azure MFA to provide a second factor of authentication to protect VPN, Remote Desktop Gateway connections, or other RADIUS capable applications. Users that register for Azure MFA in this environment will be challenged for all authentication attempts, the lack of conditional access policies mean MFA is always required. If you have an NPS instance deployed and in use already, reference Integrate your existing NPS Infrastructure with Azure Multi-Factor Authentication. If you are setting up NPS for the first time, refer to Network Policy Server (NPS) for instructions. 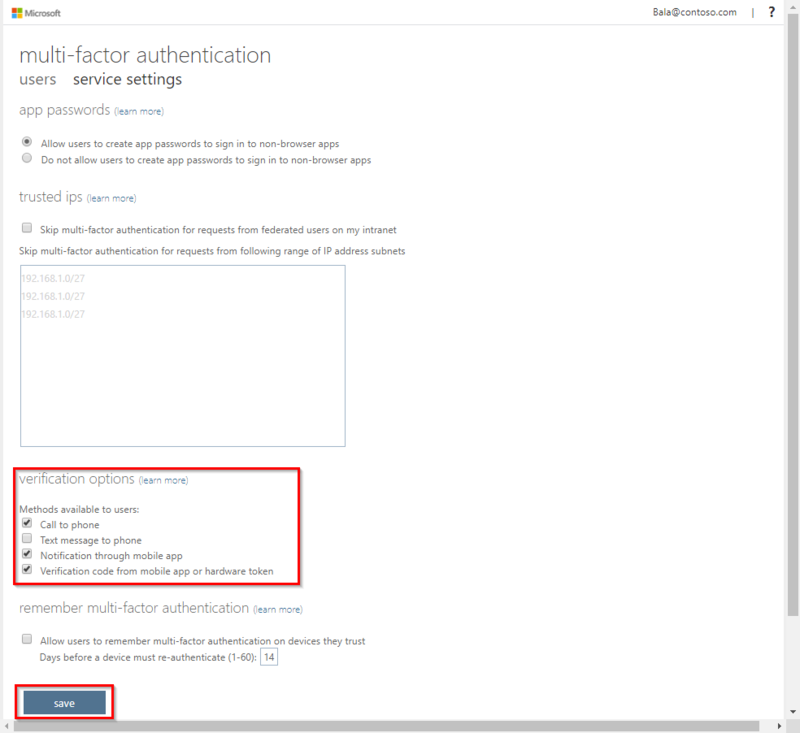 Troubleshooting guidance can be found in the article Resolve error messages from the NPS extension for Azure Multi-Factor Authentication. Choose what happens when users that aren’t enrolled with MFA try to authenticate. Use the registry setting REQUIRE_USER_MATCH in the registry path HKLM\Software\Microsoft\AzureMFA to control the feature behavior. This setting has a single configuration option. The purpose of this setting is to determine what to do when a user is not enrolled for MFA. The effects of changing this setting are listed in the table below. If your organization is federated with Azure AD, you can use Azure Multi-Factor Authentication to secure AD FS resources, both on-premises and in the cloud. Azure MFA enables you to reduce passwords and provide a more secure way to authenticate. Starting with Windows Server 2016, you can now configure Azure MFA for primary authentication. Unlike with AD FS in Windows Server 2012 R2, the AD FS 2016 Azure MFA adapter integrates directly with Azure AD and does not require an on-premises Azure MFA server. The Azure MFA adapter is built into Windows Server 2016, and there is no need for an additional installation. Conditional access is available when the application is a relying party to Azure AD, federated with AD FS 2016. Conditional access is not available when the application is a relying party to AD FS 2016 and is managed or federated with AD FS 2016. Conditional access is also not available when AD FS 2016 is configured to use Azure MFA as the primary authentication method. On each AD FS server, in the local computer My Store, there will be a self-signed Azure MFA certificate titled OU=Microsoft AD FS Azure MFA, which contains the certificate expiration date. Check the validity period of this certificate on each AD FS server to determine the expiration date. If the validity period of your certificates is nearing expiration, generate and verify a new MFA certificate on each AD FS server. The following guidance details how to manage the Azure MFA certificates on your AD FS servers. When you configure AD FS with Azure MFA, the certificates generated via the New-AdfsAzureMfaTenantCertificate PowerShell cmdlet are valid for 2 years. Renew and install the renewed certificates prior to expiration to ovoid disruptions in MFA service. Select groups to begin rolling out MFA. Usage and fraud alerts Azure AD > Sign-ins Provides information on overall usage, user summary, and user details; as well as a history of fraud alerts submitted during the date range specified. Find solutions for common issues with Azure MFA at the Troubleshooting Azure Multi-Factor Authentication article on the Microsoft Support Center.